Welcome to our Family Tree, a work in progress! Many hours have already been put into the research and documentation of our many ancestors and offspring. I hope you will enjoy the information presented here and contribute to it as time goes by. 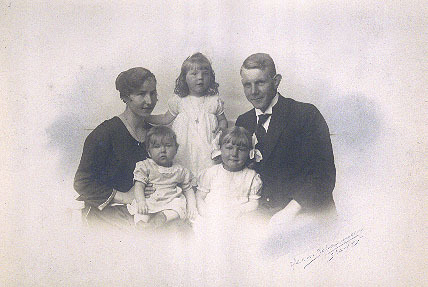 The young Haakonsen family in Norway in the early 1920s, just before they emigrated to the United States. Alma with Solveig on her lap, Kris in the center, and Anne with Hans. Elizabeth was born later in Massachusetts. And here are the girls with Alma in 1958, several years after Hans' death. Anne Larson, Elizabeth Abbott, Alma, Kris Olson, and Solveig Morehouse.